It’s hard to find this many jaw-dropping natural wonders in one area. The McInnis Canyons National Conservation Area is home to a stretch of the Colorado River, great camping and hiking, geological and paleontological sites, and impressive stone arches. 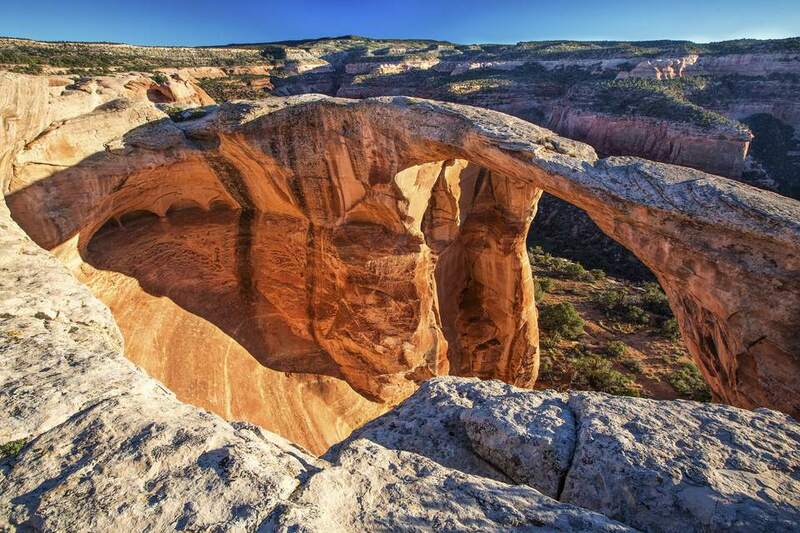 In fact, McInnis boasts the highest concentration of natural rock arches in the state and the second most in the world, only second to Arches National Park. This alone makes it a bucket-list destination in Colorado. The McInnis Valley National Conservation Area was designated in the year 2000, and today, it’s run by the Bureau of Land Management. It was named after Congressman Scott McInnis in 2005. If you’re looking for an amazing outdoor destination in southern Colorado, rich with hiking, biking, horseback riding, wildlife viewing, camping, and hunting, here’s what you need to know to explore McInnis Canyons National Conversation Area. This conservation area spans 122,300 acres. Cutting through the land is 24 miles of the Colorado River, as well as 75,500 acres of the Black Ridge Canyons Wilderness. Also in McInnis Canyons: the Rattlesnake Arches, sandstone canyons, and alcoves. You’ll see interesting plants, fossils, and ancient artifacts—plus, gorgeous views. Location: Near Grand Junction in Mesa County. The western boundary for this area is Utah. Getting There: The terrain here spans dry and high desert land to dramatic canyons. You can explore the land on foot, bike, motorcycle, ATV, or horseback ride. There are some roads specifically for cars, such as Rabbit Valley. But you can’t get deep into the wilderness unless you’re on foot or horse. Look for special areas designated for different kinds of activities. There are also multiple campgrounds and scattered campsites in the area. Make sure you reserve a spot well in advance if you want to stay the night. Hiking is popular here, and there are many different trails to explore. Paleontology trails are a big draw to this area; how often can you incorporate a living history museum with your mountain hike? A great starting point is the Rabbit Valley Trail Through Time (aptly named). This short (1.4 mile) and easy (elevation gain: 180 feet) loop is technically an interpretive trail, complete with an information kiosk. Along this path, you can see the fossils of dinosaurs discovered at a working quarry. You’ll learn about all the dinos that were found in the area. Due to the short length and educational aspect, this path is a draw for families. For a less structured but equally as impressive hike, the McDonald Creek Canyon hike brings you along a stream for 3.7 miles (there and back) until you reach the Colorado River. Here, keep your eyes open for rock art made by ancient people. Tip: Pack binoculars. They can be useful and will remove the temptation you might feel to step off the trail (which is not advised, to protect the natural habitat). While it's a bit long, the elevation gain is minimal, just 190 feet. The (also aptly named) Dinosaur Hill Trail is a fit for people who want to combine dinosaur fossils with quick exercise and great views. This is where the Brontosaurus was recovered here in 1901 and still today, it’s one of the most complete fossil discoveries of this species. This hike is rated for all levels, though the Bureau of Land Management calls it "mildly strenuous," with an elevation gain of less than 180 feet. Regardless, it’s short: about one mile long. At the top, there’s a panorama that you’ll never forget. The Old Spanish Trail: A piece of this historic trail runs through the area. The Kokopelli Trail: This 142-mile trail is big among mountain bikers. It goes all the way to Moab, Utah. Wildlife viewing: Expect to see livestock here. It’s also home to elk, black bears, desert bighorn sheep, trophy mule deer, various birds, mountain lions, bald and golden eagles and more. Kayaking: Go canoeing or kayaking on the Colorado River. Horseback riding: A great trail for horseback riding is aptly named Wild Horse Mesa. Camping: The area has three campgrounds: Knowles Overlook, Jouflas and Castle Rocks. There are also several individual campsites located throughout the area. These are numbered and clearly marked and must be reserved. You can’t just pop up a tent wherever you want, and there are certain other requirements in order to do so (such as you must have a portable toilet).